Solpadeine Max combines paracetamol and codeine to provide effective pain relief. Relieves discomfort in colds, influenza, and sore throats. Solpadeine Max combines paracetamol and codeine to provide effective pain relief. non-serious arthritic and rheumatic pain. Relieves discomfort in colds, influenza, sore throats and helps reduce temperature. 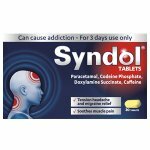 Contains two analgesics (painkillers), paracetamol and codeine, which work by different body routes to relieve pain. In addition paracetamol is an antipyretic (helps to reduce body temperature when you have a fever). Do not take more frequently than every 4 hours. Do not take more than 8 tablets in 24 hours. Do not give to children under 12 years of age. KEEP ALL MEDICIINES OUT OF REACH AND SIGHT OF CHILDREN. 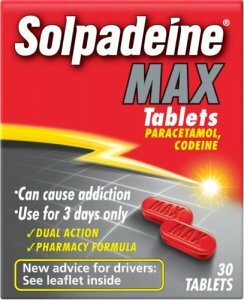 Solpadeine Max should not be taken if you are sensitive to paracetamol, codeine or to any of the other ingredients listed above. You are taking drugs prescribed for depression (MAOIs). You are taking anti-coagulants (drugs to thin the blood e.g. warfarin) and you need to take a painkiller on a daily basis over a long period. However, you can take occasional doses of Solpadeine Max. The tablets contain lactose. If you have been told by your doctor that you have intolerance to some sugars, contact your doctor before taking this medicinal product. Please see your doctor before you take Solpadeine Max if you are pregnant. Medicines can affect the unborn baby. Always talk to your doctor or pharmacist before taking any medicines in pregnancy. 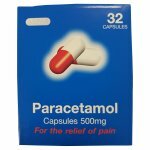 Paracetamol 500 mg and Codeine Phosphate Hemihydrate 12.8 mg, Soluble starch, polyvinylpyrrolidone, potassium sorbate (E202), maize starch, talc, magnesium stearate, stearic acid, microcrystalline cellulose, croscarmellose sodium, lactose monohydrate, hydroxypropyl methylcellulose, macrogol and colours quinoline yellow (E104) erythrosine (E127) and titanium dioxide (E171).